Funfetti cake from Bud & Marilyn's. 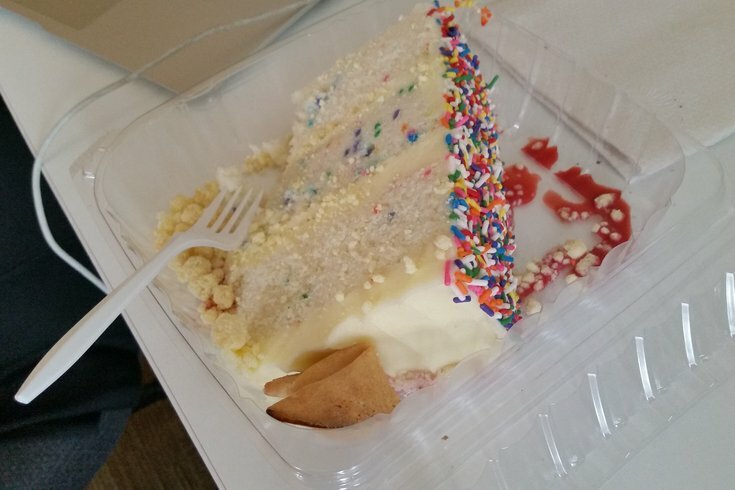 Not sure if this will become a regular feature but I wanted to share with everyone that one of my millennial co-workers called up Bud & Marilyn's and had them deliver a big piece of "funfetti" cake for lunch. It's a deal today from the Caviar delivery service. This person also got a piece to bring home for mom and it's sitting there in the mini-fridge. The cake costs $2 a slice and comes with a fortune cookie. My co-worker's fortune reads: "Three months from this date, good things will happen." So keep an eye on that. This has been My Millennial Co-worker. Thank you and good night.